Can Ask.com's New Search Strategy Work? What happened to Ask.com's search engine? It was put out to pasture Tuesday by the company that says it's giving up on trying to compete with Google. Ask.com says its getting out of the search engine business but stresses its Ask.com site isn't going anywhere. It will live on -- and so will Ask Jeeves "the butler," the company says. Moving forward Ask.com will focus on providing a topnotch question-and-answer service helping people find what they are looking. Ask.com says it will still offer a search option, but will outsource the search technology to a yet to be named third-partly. The sites departure from using a search algorithm was announced by Doug Leeds, president of Ask.com, which is a unit of IAC/InterActiveCorp. It's estimated that the site currently has a two percent share of the U.S. online search market. By contrast, the market leader Google has a 65 percent share. The closing of the search service will cost 130 engineers in Edison, New Jersey and Hangzhou, China their jobs, although 20 of the Garden State workers are being asked to relocate to Oakland, Calif., where the search unit's headquarters is located, Leeds told Bloomberg news. All work on its algorithmic search technology will cease, he added. While search operations will be put to rest, the unit will continue to operate, focusing its efforts on its question-and-answer service. Ask.com was launched in the late 1990s as Ask Jeeves, a search site that was designed to offer answers to natural-language queries. It was designed so that users could pose questions in plain English; those questions were then fed through a database of question templates that had been matched with Web pages by a team of human editors. The site, complete with its mascot -- Jeeves, the butler -- was designed to be your own personal Internet valet. 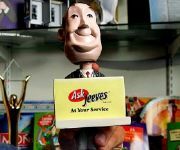 But many users were left unsatisfied with its results, and the site struggled mightily in the early 2000s, and eventually dumped Jeeves as a mascot and rebranded itself as plain-old Ask.com. Ask was purchased in 2005 for $1.85 billion by Media Mogul Barry Diller. "A group of four or five players is going to be able to thrive in this market, much like other advertising-supported media businesses," Diller said when he bought Ask. "Because of that, a player like Ask has the greatest opportunity for gaining share." According to the Nielsen Company, Ask is ranked sixth among search providers. Leeds admitted to Bloomberg that Google became too much for Ask to compete with. "It's become this huge juggernaut of a company that we really thought we could compete against by innovating," he said. "We did a great job of holding our market share but it wasn't enough to grow the way IAC had hoped we would grow when it bought us." Diller, too, admitted as much in an email statement sent to the business news service. "We've realized in the last few years you can't compete head on with Google," he said. As of this afternoon, Web search was still available at the Ask site. A search with the term "Ask.com" yielded no results mentioning the death of the service.